My husband is home from sailing training in Antigua and he’s already thinking about where he would like to go next for training: Gibraltar. Why? Because Gibraltar has tides. The Caribbean, which is where he has just been, does not. In an article called “Caribbean Tides, Killer Words” Matthew Alice identifies there to be about a dozen amphidromic areas in the world. The Caribbean coast is one of them. As Steve Baum explains, “[an] amphidrome is a stationary ocean point around which tides rotate” in either a counterclockwise or clockwise direction. The direction will depend on whether you are in the northern or southern hemisphere, respectively. (S. Baum, The Encyclopedia of Earth, “Amphridrome”). 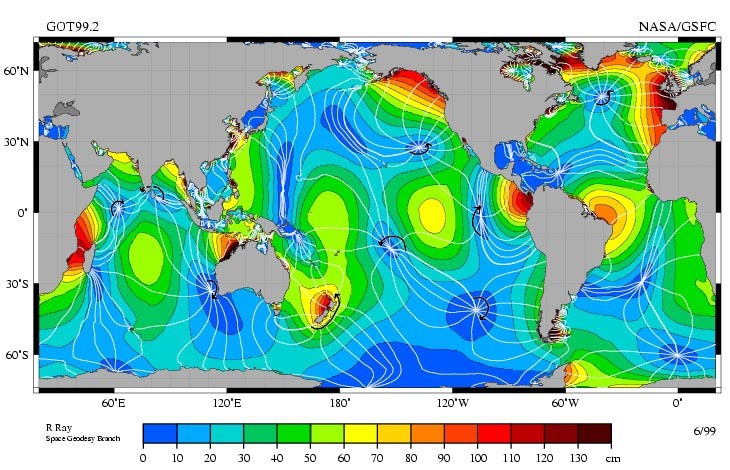 The rotational behaviour of the tides is called the Coriolis effect. (M. Alice). Matthew Alice likens the tides at an amphidromic point as being similar to the motion when you swill a coffee cup, the edges move, but the center remains relatively flat and constant. The Caribbean is an example of an area that remains relatively flat and constant. The following map displays global distribution of amphidromic points. On the map above, the colour scale indicates the strength of the tide “with blues being weaker areas and reds being stronger”. (S. Baum, “Amphridrome”). The amphidromic areas appear as spider-like formations, and because there’s little movement in terms of tide, they are accompanied by areas of dark blue sea. Perth, Australia on the Western coast experiences small tides because of its proximity to an amphidromic area. (Flinders University, Exercises in Physical Oceanography, “Exercise 5: Tides”). If you’d like to learn more about amphidromic areas and why they occur see the Southampton University website for an article called, “Amphidromic Points: tidal spiders in a real World“. This article is sure to satiate the curiosity of the most geeky of geeks. And, I do say this with affection. My own husband has a passion for math and physics.